Stocks ended a volatile week with modest gains Friday, but the S&P 500 had its worst week in three months. The Dow Jones industrial average, the S&P 500 and the Nasdaq all ended higher, shaking off earlier weakness. The Nasdaq was the best performer, adding nearly 0.4%. The Dow and S&P 500 both gained about 0.1%. Is a correction brewing? Despite Friday's gains, the S&P 500 ended the week down 0.9%, the biggest weekly decline since April. The Nasdaq was down 1.6% and the Dow was off 0.7%. Dave Rovelli, managing director of U.S. equity trading at Canaccord Genuity, said many investors are wondering if the market is on the verge of a long-awaited correction, typically defined as a drop of 10% or more from the most recent high. The Russell 2000 index of small company stocks, often seen as a leading indicator for the broader market, fell nearly 4% this week. Stocks haven't experienced a correction in quite some time, and many investors would welcome the opportunity to buy into the market at more attractive prices. "The market is still in a long-term up trend," said Rovelli. "A pullback wouldn't be the worst thing in the world, and it would give people a better entry point." 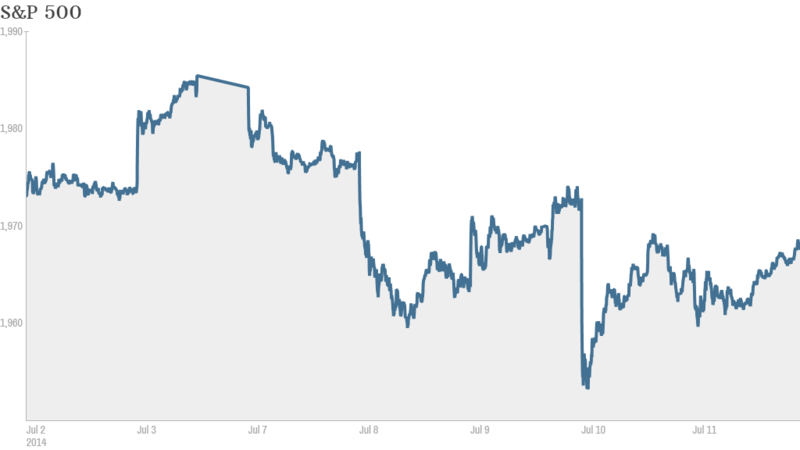 While there's a lot of choppiness in the markets this week, experts told CNNMoney that stocks will continue to go up this year. On average, they expect the S&P 500 to finish the year about 9% higher (it's currently up just over 6%). 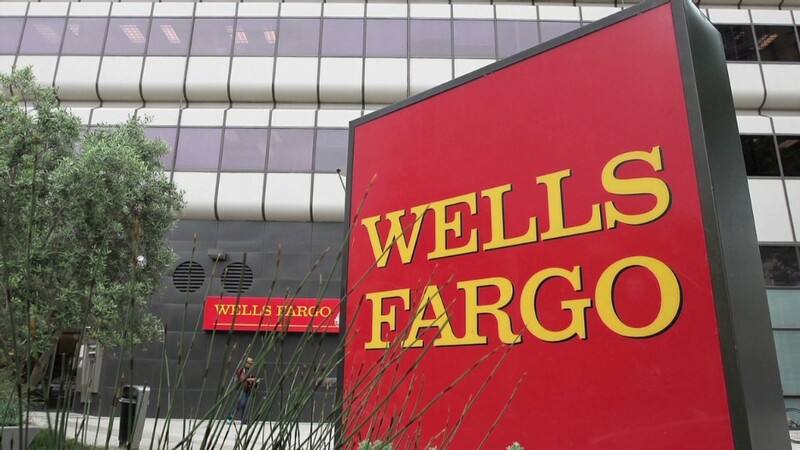 What's moving -- Wells Fargo, Tobacco stocks: Shares of Wells Fargo (WFC) were under pressure after the nation's largest bank by market cap reported earnings that were in line with analysts' expectations. Wells Fargo is the first major U.S. bank to report second quarter results. Citibank (C), JPMorgan (JPM), Goldman Sachs (GS), Bank of America (BAC) and Morgan Stanley (MS) all open their books next week. Imperial Tobacco, a global tobacco company based in England, is in talks to buy certain brands from Reynolds American (RAI) and Lorillard (LO). The deal would combine two of the largest U.S. cigarette brands into a company with a potential market value of $56 billion, according to Daniel Sugarman, a market strategist at ETX Capital in London. Mortgage insurers hammered: Shares of MGIC Investment (MTG)were halted after falling more than 10% in heavy volume. Other mortgage insurance companies were down sharply on concerns that new regulations could force them to raise capital. Genworth Financia (GNW)l and Radian Group (RDN)both sank as well. Amazon drones on: Amazon (AMZN) has asked the Federal Aviation Administration for permission to conduct tests of its planned drone delivery service near its headquarters in Seattle. The stock was up 4%, though it's still down sharply for the year. Trading of suspicious stock halted: Trading in shares of Cynk Technology (CYNK), which have soared 25,000% since mid-June, was halted Friday by the Securities and Exchange Commission. The SEC said the suspension was due to concerns about "the accuracy and adequacy of information in the marketplace and potentially manipulative transactions in CYNK's common stock." Europe regains composure. Most stock markets in Europe ended higher, reversing Thursday's losses. Asian markets ended mixed. Shares in Banco Espirito Santo were suspended on Thursday, but not before they slumped 17%, taking losses for the year to 46%. Banco Esperito resumed trading Friday and said it has sufficient capital to cover any losses. The stock stabilized Friday after regulators announced a temporary ban on short selling in the bank's shares.